Garmin zumo 590LM is a motorcycle sat nav that is built for the job with a rugged design. The zumo 590LM features a dual orientation 5-inch touchscreen and will direct you to your destination with voice directions using Bluetooth headset technology inside your helmet. Additional features include Garmin Real Directions, Active Lane Guidance and PhotoReal Junction all helping you to navigate along your journey. On screen information includes your route, speed limit, current speed, time of arrival, name of current street and can also display POIs such as food and fuel. Other features include an MP3 player and mobile phone calls, weather and traffic when connected to a smartphone. It is also compatible with the Tyre Pressure Monitor Sensor and VIRB devices and Topo Maps can be used with the 590LM too. Garmin zumo 590LM has been discontinued. The Garmin zumo 590LM has been replaced by the zumo 595LM (pictured below). Accessories are available for your Garmin zumo 590. Likewise you can buy new maps. The zumo 590LM is a motorbike navigation device. It is built to withstand road and weather conditions and will guide you via voice prompts to your headset including directions relating to street names and navigation. Furthermore Garmin Real Directions guides you mentioning landmarks and traffic lights. The 590LM also includes Lifetime Map Updates so you are assured you will always have the latest points or interest, addresses, roads and navigation information. The screen on the zumo 590LM is 5-inches and features dual-orientation mode meaning you can view the screen horizontal or vertical to see more of the route ahead. The screen is also touchscreen, sun-light readable and glove friendly. The screen clearly displays your route ahead, speed limit, current speed, time of arrival, name of current street and also can show you places up ahead such as fuel, food and cash machines. At dual-carriageway and motorway junctions Active Lane Guidance provides a bright arrow and voice prompt regarding the lane to be in. Furthermore Bird’s Eye Junction view and PhotoReal Junction will provide a view overhead and also displays surrounding landscape. With a Bluetooth headset you can make and receive phone calls when connected to your smartphone. Connecting the 590LM to a smartphone you can also get weather radar and traffic information (subscription required). The zumo 590LM also includes a built-in MP3 player. You can also connect this device to your Apple iPod or iPhone. You can set the 590LM to route you according to time, distance or location. Furthermore you can be routed along Curvy roads. With this preference setting you will be routed along winding rides. There is a Service History Log that records tyre mileage, tyre changes, chain cleanings, oil changes, new spark plugs and it can store Date, mileage and performed maintenance stats. The zumo 590LM can also be used in a car and an automotive mount and power cable are included with your purchase specifically for this purpose. The Garmin zumo 590LM is compatible with the Garmin motorcycle tyre pressure monitor sensor accessory, which enables you to check your motorcycles tyre pressure whenever you choose to on the 590LM's 5 inch screen. To learn more click here. The Garmin zumo 660, like all Garmin sat nav's, gets its speed camera data from the Cyclops speed camera database. The database provides advanced alerts to fixed, average speed, mobile, variable, temporary roadwork, red light and red light speed cameras. As you approach a camera, your device sounds an alert. Subscription charges apply. Click here to read more about the Cyclops speed trap database. Cardo Scala Rider headsets are available to pair with your Garmin zumo 590. The benefits of buying and using a Scala Rider headset with your Garmin zumo 590 are three-fold; 1. you can listen to sat nav voice turn-by-turn instructions, 2. listen to music and 3. communicate with other motorcyclists whilst riding (using the intercom when within range and mobile phone when out of range). 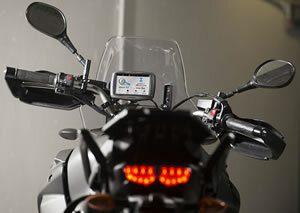 The Garmin zumo 590LM includes everything you need to mount and install it on the handlebar of most motorbikes. Included when you purchase from ActiveGPS is a RAM mount designed to attach onto the handlebar of your motorcycle. Once this is fitted, a unique zumo 590 motorcycle mount cradle and power cable which is also included can be fitted to the RAM mount. You're then ready to ride with the Garmin zumo 590. As well as all the necessary fixings and fitting to mount on your motorbike. The Garmin zumo 590LM when purchased from ActiveGPS.co.uk also includes a car mount and car charger. Simply position the automotive mount on your vehicles windscreen using the suction cup mount and power via your vehicles cigarette lighter adaptor with the automotive power cable and you are ready to use the motorcycle sat nav in your car. 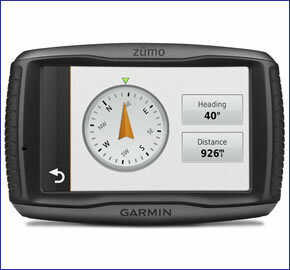 Garmin zumo 590LM is preloaded with City Navigator NT for the UK, Ireland, Western and Eastern Europe provided by here. These maps can be updated FREE for the life of the product, when you register your zumo 590LM with Garmin UK. Further Garmin zumo 590LM maps are available on SD card which insert directly into the Garmin zumo 590. Available Garmin zumo 590 maps include North America, Australia and New Zealand, Middle East and Southeast Asia. Click here. The zumo 590LM includes all the accessories you need to get you up and running, not only on your motorbike, but also in your car/van too. However, if you'd like to take advantage of the zumo 590 ANT+ connectivity, you might like to consider buying some tyre pressure monitor caps. Many additional parts are also available including a carrying case, replacement battery, RAM mount kit, motorcycle mount and mount weather cap. The Garmin zumo 590LM is preloaded with street-level road maps for all of Europe. If however, you want to take the zumo 590LM further afield, we may have the map that you need. Garmin zumo maps available include: USA, Canada and Mexico, Australia and New Zealand, Morocco and Southern Africa. Question: Can you get the USB weather cap for the Garmin zumo 590? Answer: The only weather cap we can obtain from Garmin UK and that we sell for use with the Garmin zumo 590 is this one. Question: I am considering buying the Garmin zumo 590LM sat nav, and notice that a RAM mount is included. However, I have a Honda Pan European ST1100, and there is not a centimetre of naked handlebar. Do you have any kits / ideas for the ST1100, please? Answer: The included RAM mount kit with the zumo 590LM is a standard size. You would need to contact RAM directly to obtain alternative sized mounts. Do you have a question about the Garmin zumo 590? Submit your question via our contact page.